It is a server-side web application framework. It is designed for web development specially to make dynamic web pages. 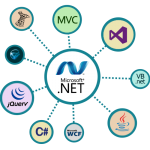 ASP.NET is built on the Common Language Runtime (CLR), permitting programmers to write ASP.NET code using any supported. ASP.NET is the technology for programming the Web Applications. WebForms are part of ASP.NET. ASP.NET never depends on any particular language. But, VB.NET is a language just like C#. VB.NET is a language. But, ASP.NET is a tool. ASP.NET has many features. We are discussing some features of ASP.NET. It is a full-featured development environment for creating ASP.NET Web applications. Using Visual Studio 2010, one can build different types of ASP.NET projects, which includes Web sites, Web applications, Web services, AJAX server controls etc. .NET framework class library contains some important namespaces like System.Web, System Web Application Services, System Runtime Caching etc. 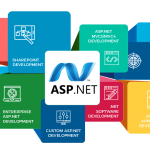 The ASP.NET page and controls framework is a programming framework that runs on a Web server to dynamically create and concentrate ASP.NET Web pages. All ASP.NET code is compiled. Once the code has been compiled, the CRL (common language runtime) further compiles ASP.NET code to native code, providing improved performance. ASP.NET provides an advanced security infrastructure. BigClasses is one of the best online training organizations offer ASP .Net training. We have qualified and experienced faculties who are responsible for taking the online sessions. We provide study materials and 24 hours support to our national and international learners as well. If you are interested inASP .Net online training, contact us for the detailed course and the free demo classes.